Fenwick Island, Delaware is a barrier island that lies at the very southern border of Delaware with Maryland. In the mid Nineteenth Century, an increasing number of shipwrecks near the Fenwick Shoals, about 6 miles off-shore of Fenwick Island, prompted the United States Lighthouse Board to recommend the construction of a lighthouse to help mariners avoid the shoals. Congress agreed with the Lighthouse Board and authorized $25,000 in 1856 for establishment of a lighthouse on Fenwick Island. The United States Government paid Mary Hall $50 for ten acres of land for what was considered the highest point on the island, the site was just feet from the Transpeninsular Marker that defines the Delaware and Maryland State lines. The station was completed and the lamp was lit for the first time August 1,1859. The 87-foot tower has an unusual design in that the outer brick tower is conical, while a second inner brick tower is an 8-foot diameter cylinder. 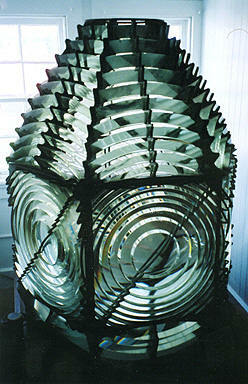 The lighthouse housed a third-order Fresnel lens. The lens was named for its inventor, physicist Augustin Fresnel, who designed lenses that collected, and focused the light rays into a horizontal beam far more efficiently than a reflector system. Fresnel’s optic array increased light output dramatically from the old reflector systems, with as much as eighty percent of the light being transmitted over twenty miles out to sea. The Fenwick Island Light beam could be seen fifteen miles in the ocean. The original lamp burned whale oil. The keeper’s residence, which included cisterns in the basement for collecting rain water, was built just east of the tower. The entire cost of the project came to $23,748.96. In the beginning, two families were housed in a space large enough for only one family, and the dwelling became over-crowded quickly. The keeper and his family lived on the first floor while the assistant keeper and his family lived on the second floor. In 1878, the Lighthouse Board recommended an addition to the existing residence and then finally in 1881, an entirely new residence was built just to the west of the tower. The head keeper moved into the new residence, and the assistant keeper remained in the original. The Fenwick Island Light Station was extremely isolated and access to the Delaware mainland was limited by crossing “the Ditch” by boat. “The Ditch” was a large canal of the Assawoman Bay that flowed to the Atlantic Ocean. The first bridge across “the Ditch” to the mainland was built in 1880. Several different versions have replaced that first bridge through the years. The current bridge is concrete and was built by the State of Delaware in 1958. The lighthouse was automated in the late 1940’s and the U.S. Government sold off most of the original property. The last keeper, Charles L. Gray, purchased several acres of land and whose family still resides on that original property. The two keepers houses are now private residences. The lighthouse was decommissioned in 1978 by the U.S. Coast Guard. The light was turned off, and the Fresnel lens removed. The citizens of Delaware, Maryland, and visitors from all over the world, protested the “turning-off” of the lighthouse and petitioned the U.S. Coast Guard to turn the light back on. In 1981, after three years of being dark, and with the help of our senators, congressmen, visitors, friends, and neighbors the Coast Guard passed ownership of the lighthouse to the State of Delaware. In 1982, a symbolic light was placed in the tower, and the lighthouse was relit, only this time with electricity. Eventually, the “Friends,” with the help of many elected officials and thousands of concerned citizens convinced the Coast Guard to return the lighthouse to its original grandness and return the Third Order Fresnel lens. The new “guardian” citizens group that formed under the leadership of Mr. Paul Pepper, “Friends of the Fenwick Island Lighthouse” during the fight to turn the light back on was charged by the State of Delaware with the monumental task to care for, maintain, and protect the lighthouse. As so for over twenty-five years the volunteer group told many a story, collected donations, and “kept the light on,” and we thank them.